No, Monkey! That’s My Cool Whip! When I was growing up in Delaware, I was part of a typical nuclear family. I’m not referring to the fact that we lived uncomfortably close to Three Mile Island;I mean I grew up with a mom, a dad, a brother, and a dog- an average American family during the 80s. Of course our family just wasn’t complete without the dog. It’s almost like having a dog is a comforting norm, or the furry icing on the cake… Eww… Furry icing… Eww. Before I moved out, my dog had to be put to sleep, and we had about 7 cats and a guinea pig. I took Kirby, the g-pig with me to college and he kept me company until he passed away too. So for the first time in a long time, I was pet-less. It was fine with me, I had a lot going on during college, and spent most of my time at work and school. I probably could have gone my whole life without another pet, but then I met my husband, Dr. Doolittle. Seriously, my husband loves animals and constantly has to have one or more in the house. Right after we met, we HAD to pick out a puppy- little Angus. He was very adorable but ran away shortly after we bought him. Then the cat my husband already had, gave birth to 4 kittens. When I moved back to Delaware with my husband, we got another dog, and rescued a baby crow from the middle of the highway. So nothing out of the ordinary, right? Well, just wait, everything changed when we moved again. A few years after we had our daughter, we decided to take her on a drive-through safari. We basically drove through a trail in the middle of a forest and fed deer from the window. Oh, my daughter and I were sneezed on by a Zebra, but again, that’s normal, right? Well, that day, before we left, we looked through the gift shop and bought my daughter a little something to remember the trip. As we were paying though, my husband saw a poster by the register that said, “Potbelly Piglets For Sale”. And yes, you guessed it… We left there with a little fuzzy piglet. What an experience! Bubbles, the potbelly pig was very smart. Within two days, she was litter-box trained. 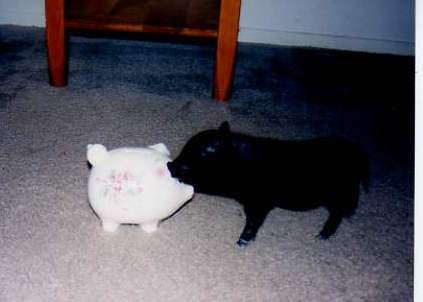 She loved to play and nuzzle, and I think she fell in love with my daughter’s piggy bank. Much like we rescued the crow from the middle of the road and fed it with an eye-dropper, my husband felt the need to rescue another animal. This time it was a baby squirrel! My husband heard a woman at his office mention that her boyfriend was standing outside one day, when a baby squirrel ran up his leg. It had been running away from a member of Animal Control. The mama squirrel had been killed and someone called the city to have the babies rounded up. This cute little fuzzy squirrel didn’t want to go into the net, so it escaped to someone’s shoulder instead. The man felt the need to take this squirrel in, but then decided to find it another home. Guess who volunteered! Yes, that’s right. I’m married to freakin’ Jack Hanna!!!! So we became the owners of a baby squirrel, and named her Nonni. Nonni was very sweet, loved to cuddle, and loved to eat mandarin oranges. Aww… Baby squirrel… Awwwwww. So are we done with unusual pets? In my husband’s opinion… No! He will not be happy until we have this one last addition to the family. A turtle? No. A goat? No, but he wouldn’t mind having one. A hedgehog? I wish! He wants… Wait for it… A MONKEY!!!!! We don’t plan on having more children, yet he wants a mother flippin’ monkey!!! An animal that is the equivalent of having a 2 year old forever!! Do you see all of the exclamation points I’m using?!!! I’m flabbergasted, and I don’t use that term loosely or often!! I calmly tried to explain the cons to him (like how a monkey could eat our faces off while we sleep), but it was of no use. Because next to my logical reasoning for NOT wanting a monkey, we have one of our good friends telling him how great of an idea having a monkey would be. Our friend based his opinion on a TV show he watched that documented a family who had out of control dogs, and a pet Capuchin. He proceeded to tell us about the monkey’s affinity for Cool Whip, and how the monkey would open the refrigerator, pull out the plastic tub, climb on top of the cabinets, and scoop globs of whipped topping out with its little monkey hand and eat it like it was an antidote. Well, in my husband’s opinion, that story sealed the deal. He had already thought it would be cool to have the monkey help him with things. Like, “Hey monkey, help me find my keys.” or “Monkey, scratch my back.” I’m sure I would even hear, “Monkey, let’s play video games!” In my husband’s mind, owning a monkey would mean that he has accomplished all he has dreamed of doing. He could even be given the choice of an all expense paid trip to Hawaii or a monkey, and he would choose the latter. Who am I kidding? He could be offered a brand new house AND a car, but he would still choose the monkey!! I told my husband if he did bring home a monkey, to make sure he brings home papers. I’m not referring to the newspaper used to line a cage, but rather divorce papers. I know that sounds drastic, but remember, having a pet monkey would be like having a toddler. Well, like having an acrobatic toddler who never outgrows diapers and at any moment could bite off my ear, like a little furry Mike Tyson. My family is already a tad whacky; I don’t need to be around any more… Um… Monkey business, for lack of a better term. I think adding a monkey would throw a wrench into my future plans (yes, a monkey wrench). Have you had any unusual pets, or do you want one in the future? Posted on July 13, 2012, in Diary and tagged Animals, Family, Lessons, Life, Pets, Stress, Weird, What if?. Bookmark the permalink. 5 Comments. Hey Babe, you forgot to mention that I had to climb into the rhino pen to distract a rhino so the guy could grab the pig. Lovely story. Ask Mr. Hanna if he wants to go to the Rattlesnake Roundup with Max and I some March. Promise I won’t let him bring anything home.